Is this argument valid or invalid? I’m pretty stumped, but I’m going to say invalid because the premises contradict each other, but I honestly don’t know. Also, in addition to valid and invalid, could you explain why that is the case? Thanks! This argument is valid on most definitions of validity. The common definition of validity in use today is: if the premises are true, then the conclusion must be true. worded another way, there must be no possible way for it to have all true premises and a false conclusion. The value of validity (on this definition) is that it checks whether an argument is truth-preserving -- i.e. if you make all of its premises true, would the conclusion then also be true? The argument you're looking at depends on a trick in the definition of validity: In your argument, it is impossible for all of the premises to be true at the same time because 1. S or R and 2. not S and not R are contradictory premises. Since you can never construct a case where you made all premises true and the conclusion false, it is never the case all true premises gives you a false conclusion (because it is never the case that there are all true premises). The validity of this argument relates to the principle of explosion since once we've hit a contradiction, all the rules are out the window. A second and pedagogically important point is that even though in common parlance: "good" , "sound", "valid", "strong", "clear" and many other words have similar seeming meanings, in logic, they each have a distinct meaning. An argument of this form is valid but it's not really a good argument, because as Mark Andrews points there's no relation between these premises and this conclusion. If you're doing some rather advanced logic (not your first course in formal logic or critical thinking), you may run into other definition of validity. On some of these, this argument fails, because you cannot construct a model with these premises and this conclusion. But this isn't your garden-variety definition. An invalid argument, is an argument whose conclusion is false even if the premises are true. We normally try to invalidate an argument, if we fail then it is valid. Let us set the premises to true (1), and the conclusion to false (0), and see if this is possible. For the conclusion to be false, B has to be false, so we put 0 next to B. 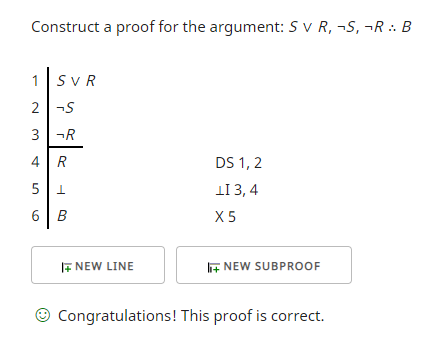 For ~S & ~R to be true, both R and S have to be false, so we put 0 next to R and S in the whole argument. As you can see, the first premise cannot be true since 0 v 0 = 0 not 1. As you can see, we could not set the premises to 1 and the conclusion to 0, so the argument is valid. This is how I check if propositional arguments are valid, first I set the conclusion to false (0), and the premises to 1, and I work my way through the premises to check if this is possible, if it is not possible, then the argument has to be valid. The reason why the argument's conclusion does not make sense is because it violates the law of non-contradiction. So, there is an inconsistency in the premises. So, why does this inconsistency make the argument valid? Simply because, it is impossible for two inconsistent premises (two premises that are contradictory) to be both true. That is why it is intrinsically impossible for all the premises to be true. Which makes it intrinsically impossible for the conclusion to be false and the premises to be true (Hence it is impossible to invalidate the argument), this is the reason the result (by formal standards) is a valid argument. And although the argument is formally valid (according to our definition of validity), it is fallacious, and therefore can be considered, informally at least, a bad argument, and there is a good reason to reject such an argument. Additionally, the argument commits a black and white (false dilemma) fallacy, the first premise either it is sunny or raining to be specific. It can be neither sunny or raining i.e : Cloudy day`. This false dilemma is what makes the premises sound true (to some) in a natural human language. I agree with @virmaior's answer. Line 4 is obtained from disjunctive syllogism (DS) on lines 1 and 2. See section 16.2 in forallx. Line 5 introduces a contradiction from lines 3 and 4. Line 6 comes from explosion (X) from line 5. It is a kind of elimination rule for ‘⊥’, and known as explosion. If we obtain a contradiction, symbolized by ‘⊥’, then we can infer whatever we like. How can this be motivated, as a rule of argumentation? Well, consider the English rhetorical device ‘. . . and if that’s true, I’ll eat my hat’. Since contradictions simply cannot be true, if one is true then not only will I eat my hat, I’ll have it too. I found it helpful to split the explosion into two. You can introduce an or with a true statement and anything. It is raining or the Bruins will win. The argument is valid. However, the first premise is clearly wrong. "Either it is sunny or it is raining" isn't true. It could be cloudly, there could be snow. Or there could be a tiny bit of precipitation, where people disagree whether it is raining or not. If you believe that A is true, and at the same time believe that (not A) is true, then either your belief about A is wrong, or your belief about (not A) is wrong, or what you believed is (not A) isn't actually (not A) but something different, or logic is seriously broken. In this case, your belief about A is wrong. Not the answer you're looking for? Browse other questions tagged validity or ask your own question. Can an argument be valid if one of its premises is invalid? Can you make a valid inference invalid by adding extra premises? Are valid arguments content blind?